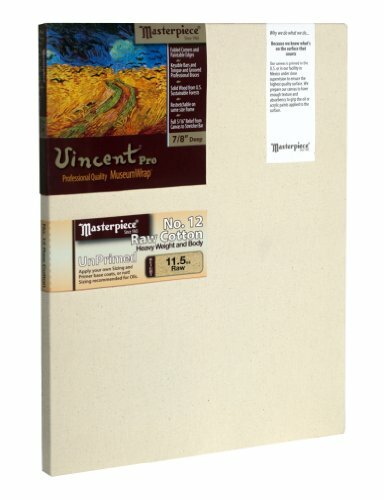 24-Inch by 48-Inch Masterpiece Vincent Pro 7/8" Deep Artist Canvas. Masterpiece Raw Unprimed canvas is based on a #12 cotton duck canvas with an 11.5 oz. raw weight. Take control of your art by preparing your own surface to achieve a particular look or finish. Use bare expanses of canvas as part of the finished paintin, or prime the surface as you like. It works great for staining techniques that involve pouring thinned paints onto raw canvas in which the fabric threads soak up the paint, resulting in abstract color combinations. Staining achieves a fluid and spontaneous convergence of the image and the fabric, not possible with gesso prepared canvases. With respect to frame construction, a celebrated feature of this product is what is called "Canvas Relief", which is the space between the canvas and the Stretcher Bar. There is 5/16" of canvas relief, thereby avoiding those unsightly lines that occur when the canvas relief is less. The frame is made from solid pine or fir wood harvested from the sustainable forests of the Pacific Northwest. Finger joints are never used in Masterpiece's wood frames. They are known to fail under pressure and over time, the glue joints break down, and are generally unsuitable for canvas frames that intended to last for centuries under continual tension. Precision machined tongue-and-groove corners allow you to increase the canvas tension. A cross brace spanning both directions is included. The Stretcher Bars are slotted in the center to accept a cross brace. Patent pending keyable cross braces make it possible for the frame to be tensioned in the middle of the canvas, where it's needed the most! Both corner keys and brace keys are pre-installed.Stretched using our proprietary MuseumWrap stretching method, which means that the canvas is stretched drum-tight, up to 50% tighter than other methods, and with balanced tension across the surface of the canvas. The corners are neatly folded, uncut, and perfectly intact, thereby making it possible for the canvas to be removed and restretched on the same size frame. The edges are suitable for painting for display with or without a frame. A free inspirational art quote refrigerator magnet is included. There are over 120 to choose from! Made in North America! Heavy weight 100% cotton, 11.5 oz raw weight. Canvas is strong and tough and a uniform weave texture. Raw canvas for staining, soaking, or creating your own surface texture. Canvas Depth: 7/8", Canvas relief: 5/16" (Space between canvas and Bar). Solid Pine or Fir Stretcher Bars from the sustainable forests of the Pacific Northwest. No finger joints are allowed, which tend to fail under pressure and over time. Precision machined tongue-and-groove corners allow you to increase the canvas tension. Cross Brace Included. Bars are slotted in the center to accept cross braces. Patent Pending Keyable Cross Braces allow you to add tension to the middle of the canvas, where it's needed the mostBoth corner keys and brace keys are pre-installed. Stretched using our MuseumWrap method yielding a balanced tension across the surface of the canvas, and a drum-tight stretch that is up to 50% tighter than other methods. Folded corners mean a canvas that is uncut and perfectly intact, allowing the canvas to be removed from the frame and re-stretched. If you have any questions about this product by Masterpiece Artist Canvas, contact us by completing and submitting the form below. If you are looking for a specif part number, please include it with your message. L.Louise Art 5 Pack Stretched Paint Canvas and Palette Pad, Includes FREE Painting Video Download!